HomeExecutivesThe CX Robotics Revolution Is Here! What Should You Do? Make no mistake, the CX Robotics revolution has arrived and Intelligent Process Automation (IPA) is also here, and here with a vengeance! The People vs Robots debate has been around for at least two generations (think robots in auto assembly lines adopted by car manufacturers some decades ago) but Enterprise services have largely escaped the wrath of intelligent robots, until now!  I believe we should take notice! The only conjecture is by when with wild variations estimating that this CX Robotics revolution will take anywhere from circa 10 to 25 years to play out  possibly less depending on who you speak with and which industry sector or discipline youre analysing. I view such reports with the scrutiny that only 23 years in Executive Search can muster but my consulting in the field completely supports the proposition that we are now in the midst of a CX Robotics revolution, not so much before our eyes but more under the covers given the socio-economic hot potato that this FTE vs AI equation presents to business leaders, politicians and employees alike. Dont believe the sugar coating that accompanies the IPA sales pitch which usually goes along the lines of ..the end result is you will free up resources for humans to perform higher value chain activities. This is true but such dialogue is, at best, disingenuous in that it skirts around the reality that this is a massive underemployment equation no matter which way you try to rationalise it. Fundamental change is never an easy pill to swallow and with up to 50% of people having to find a different method of earning a living in as little as 10 years (for many it will be sooner) the image of anarchy in the streets is actually not that difficult to imagine. I will say now that I dont believe it will come to this but I think it important to analyse why automation really is coming this time around and what can be done about it to maintain your relevance in the labour market  your capacity to earn a living and map a career path no less. Why Now & What’s Changed? In the AI vs FTE equation, the CFO will tell you that they cant automate processes quickly enough! Just last week, I was privy to what started out as a Voice BPO tender that quickly morphed into a Robotics Process Automation (RPA) tender once the senior executives saw the 30% cost differential. In an era where most costs have been stripped out of the Enterprise leaving just decimal point margin opportunities for further efficiency improvements, the Robotics phenomenon presents itself along with irresistibly large OPEX savings and if you dont do it, your competitors will. It’s now a matter of survival! The market is now ready to be roboticised! Robotics and IPA are no longer an experimental, notional idea relegated to the futuristic, prototypical sections of technology conferences. It’s here and it’s now with massive reference-ability from many of the biggest corporations in the world. RPA, Smart workflow, machine learning /advanced analytics, natural language generation and cognitive agents can be deployed within a matter of weeks in some instances such is the sophistication of the Vendors, SIs and management consultancies now well versed in the full scope/design/delivery life cycle. Having said this, true AI and Cognitive Learning can take years to deploy requiring a centre of excellence and complex, multi-faceted stakeholder engagement from all areas of the org. chart block, especially in unionised environments. The automation of business processes was reported by IBM to be the key driver in implementing AI by 66 per cent of local firms, followed by cost savings (62 per cent), improved decision making (55 per cent) and to boost employee productivity (54 per cent). Global BPOs handling back, middle and front office transactions with large workforces of people in countries like the Philippines and India predicated on labour arbitrage business cases are right in the firing line. The process to package up and offshore such business processes mean the hard work has already been done with those transactions being obvious targets for chatbots and massive costs savings with 24 x 7 productivity and virtually 100% accuracy. The smart BPOs are reinventing themselves at a rate of knots, forming alliances with technology partners who will actually cannibalise their revenue on some levels but with a view to longer-term survival and relevance. 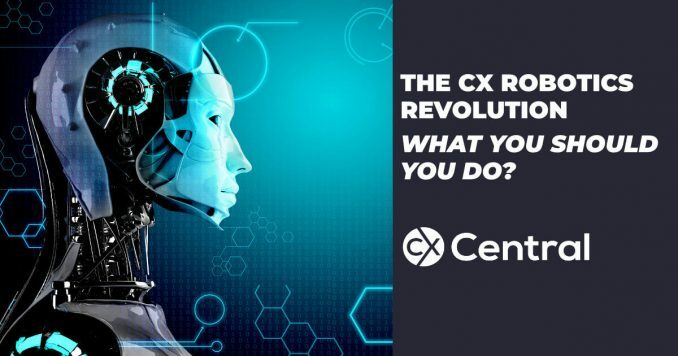 What should you do about the CX Robotics Revolution? The future Will Be About Soft Skills: Automation promises to empower workers to focus on roles requiring more human interaction so work on your professional development from an emotional intelligence platform. Personal Attributes like leadership, critical thinking, adaptability, agility and creativity could considerably reduce job losses arising from automation and these can be honed/developed as much in your extra-curricular activities, hobbies and interests as in the workplace. Now is not the time for conservatism  take risks, put your hand up for that project that will take you right out of your comfort zone. The good news is that Intelligent Process Automation carries a strong argument for bringing jobs back onshore if higher value chain activities performed by humans is indeed the future. One equation I witnessed a few weeks ago was a proposal to outsource approximately 75 jobs to the Philippines. The end result was a Robotics implementation that will retain 25 jobs onshore in Australia whilst still delivering 30% OPEX savings and thats the way the Purchase Order went! I welcome comments/thoughts/opinions on this piece as it is still very much pioneering territory for most and the more awareness that can be developed in this region, the better equipped we will be to secure our fair share of the massive global Robotics and follow on AI markets thereafter.